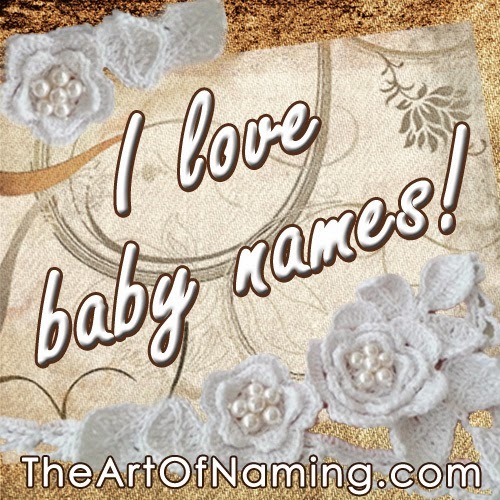 Just like fashion is constantly changing, so too are names! Occasionally, very old names will even become new and fresh again many years later! 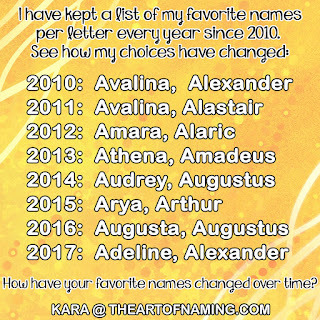 I thought it would be interesting to see just how names have changed over the years. The data that I used comes in 30-year intervals, starting in 1892 and ending last year in 2012. Much like present-day England and Wales, the 1880s in America saw the use of "nickname names" or diminutives of proper names that are used as given names. Examples above include Harry and Willie for boys, Minnie, Bessie and Annie for girls. The majority of the male names are considered classic or traditional and still see plenty of usage, with the exception of Clarence and Fred which are not currently in the top 1000 anymore. The female names have some classic choices, some vintage chic choices and some choices that might never come back in style. Florence, Ethel, Bertha, Minnie, Bessie, Ida and Edna are nowhere near the top 1000 and of those, I cannot see Bertha ever being fashionable again, and I'd be surprised to see Bessie making waves. The others have a shot to rejoin the top 1000 but not all at once. John and Mary continue to reign while Dorothy suddenly appears at #2. Many of the boys names are similar but the chart has an overall new crop of names on it compared to 1892. The boy's list is pretty solid and full of classic names that don't waver much; in fact, all of these top 20 boy names are still on the present-day top 1000. The girl's list feels like the wildcard here. 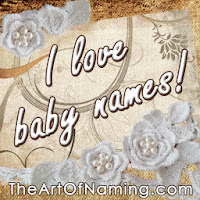 Names like Betty, Mildred, Doris, Marjorie and Jean are new to the list but are not names we hear often in present day. Other choices like Margaret, Ruth, Elizabeth, Anna, Evelyn, Marie, Alice and Lillian are still rather popular today! Now things start to really change! 30 years can make such a difference. Mary and John are dethroned, replaced by James and Linda. Dorothy is nowhere to be seen and has been taken over by fresh choices like Patricia and Deborah. Actually, Mary is the only female name to last from 1922 to 1952, even Elizabeth fell. So many of the boys names seem unshakable but we do see new options like David, Gary, Steven, Larry, Ronald, Kenneth, Mark, Dennis and Daniel. Interesting to think about how this batch of baby names now belongs on grandparents. The 80's bring about an entirely different set of names. There are a few boy's names that remain from 30 years earlier like Michael, David, James, John, Daniel, Joseph, and William, but there are no survivors on the girl's side from 1952 to 1982. Many of you probably have these types of names as the current generation of parents, whether you are brand-new or a bit experienced. I grew up with plenty of classmates with these names. The boy's names feel so traditional to me that I don't have much to say about them and the girls names feel rather dated to this time period, even if a few are classic like Elizabeth and Sarah. These are the names that the 80s kids are now giving to their children. They are much different than the names we were familiar with on our friends as we grew up, and they're not the names of our parents either. There are a few exceptions like Emma, Abigail and Elizabeth for the girls that may have been the names of our grandmothers or even great-grandmothers. The boys see a few "modern" choices sneak in among the traditional choices. There's Liam, Jayden and Aiden that seem different to me than all the others that are either biblical or very, very old. I am aware that Liam comes from William, but in this case, it's its own name. In a way, these lists have changed dramatically, and yet, we see some of the same favorites repeat year-after-year. The only two boys names that have lasted the test of time are James and William. None of the girls names last throughout all 5 lists. Elizabeth is on four of them, and would have been on all five had she not fallen to #22 in 1952. Elizabeth is the only female name to perpetually be in the top 30 since records began in 1880. While I prefer older names to the modern and trendy choices of today, I think I would choose a name off of the 2012 list before any of the others, except for the oldest one 1892. Which list is your favorite?